I am not a huge meat eater, particularly I don’t eat much beef but I do enjoy bison as a treat. Buffalo has an incredible flavor and is as simple as swapping out in any beef recipe. Bison steaks in Wyoming while traveling? Yum! Alas, it can be hard to find anything but ground Bison in regular grocery stores.Which I will add is often hidden next to the grass fed and or organic ground beef. Look hard and you might get rewarded….. 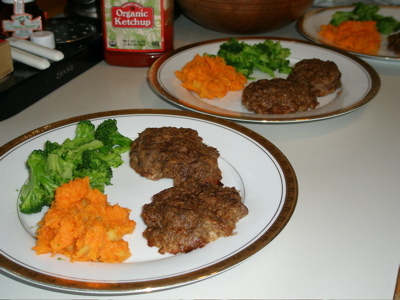 I served it with steamed broccoli and mashed male orange sweet potato/yams. Meanwhile, with a fork beat the milk and egg in large bowl. Mix in bison and bread crumbs with your hand. Shape into 6 small loaves. Place on an ungreased cookie sheet (with raised edges) . Drizzle the loaves with Worcestershire sauce and spread it on with your fingers. Notes: It took 45 minutes for mine to cook and were perfectly done. Scrub and wash the potatoes. Place in a microwave safe glass dish, tightly cover with microwave safe plastic wrap. Microwave for about 8 minutes or till done. The potatoes will be steamed. Peel carefully (hot!). Mash with a fork and blend in the maple syrup and orange juice. And what a pretty dinner! Yet another reason to go to TJs this week! !